With any luck your son won't look at the extended forecast for the week. It snowed last night, will snow Tuesday night and then Thursday during the day. Tis the season of the gift that keeps on giving. 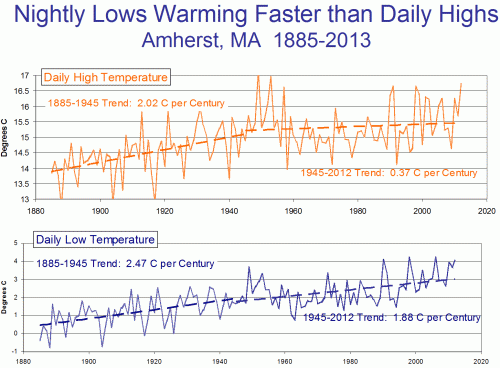 "This is as predicted by warming models"
Not exactly. It's predicted generally, globally, and in some models regionally, but not specifically for each weather station in Amherst. The earth is a relatively simple system with a radiation balance that can be crudely modeled on the back of an envelope. 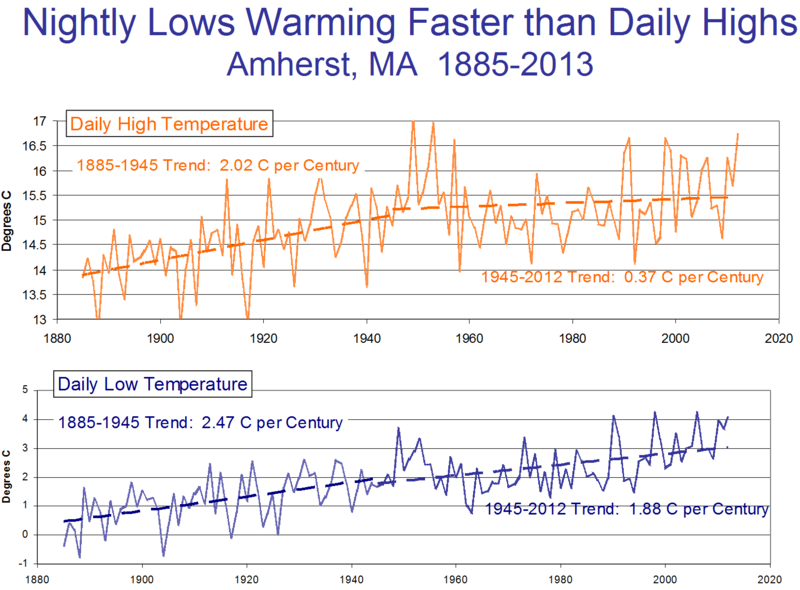 Amherst's temperature depends to a great extent on regional convection/advection patterns in the atmosphere and ocean. It does not have to track global trends and modeling is much more complex. Did you send him a down coat for Christmas? When the Dow Jones goes up 100pts. in one hour that = a rate of 172,250pts. per year. Likely much more significant is that the area surrounding Amherst has lot more thermal infrared to lose now than it did in 1945. Higher minimum temperatures, but not corresponding increases in maximum temperatures . . . "This is as predicted by warming models." To some degree :-), I can accept this statement. However, the phenomenon of higher minimum temperatures is also consistent with UHI. There are two competing explanations for this phenomenon. The phenomenon is not a fingerprint of CO2-induced warming. "The earth is a comparatively simple system with a radiation balance that can be crudely modeled on the back of an envelope." A simple system compared to what? The dynamics of a lollypop? Not that I spend much time looking, but I have yet to see this simple system or any models explained (crude or not) in any article. The first researchers to describe atmospheric forcing (CO2 + water) as the impact of stacked radiation filters in the atmosphere predicted the same order of magnitude climate sensitivity that supercomputers do today. And they essentially did it on the back if an envelope in papers from the 1890s and 1930s. Amherst is not anywhere near a closed system, so its changing temperature with radiative forcing is much much harder to model. You not only have to understand radiation in and out for the planet, but the internal dynamics of the atmosphere and ocean and a variety of local effects. Thanks for the feedback. I am quite familiar to the link you provided. About twenty-five years ago I was introduced to a very similar energy balance diagram in an engineering class. Bottom line, it is very crude concept as a whole being on a global average, day or night or season. Took the better half of the first one hour class session to cover it... then we got into the aspects of specific point of earth (land, water, ice, latitude) and the day of the year/season and the big ball of fire overhead. That was good for a week or two including the last half of the first day of class. Bottom line, for all its variability, the amorphous atmosphere is a big insulation blanket. Bottom Line, as a 'skeptic', it would really be something to find a material that accepts heat, in whatever form, and does not release it. Why have not any AGW researchers patented a new thermos(TM) which uses CO2 instead of a vacuum to keep your soup warm, or cold, it should work either way one wishes, ehhh? Put your frozen fish sticks into your magic lunch bag and soon they will be piping hot. Turn the lunch bag inside out, pour in some milk, and you will have a frosty milk shake. THAT being said, when taking the mentioned class, In thought it would be fun to use the concepts to make a crude model of the earth and be able to run it and show ice age cycles. Didn't put a lot of effort into it because I am not a geologist. Surely the climate models can do that. Surely they have already done that. 1 -5 degrees is a pretty small shift, and atmospheric green house gases are thought to play a dominant role in the magnitude of the temperature shift during interglacial-glacial transitions. And yes they model this using data on the partial pressure of CO2 through time. Do you believe in greenhouses? I stated bluntly that the earth energy balance you linked was known to be crude 25 years ago (not suggesting you are crude). I threw a carrot suggesting such a simplistic model, might, might crudely model ice ages, something I myself wanted to do. Never seen it done. And you ask, "What's your point?" It's all garbage if they cannot model the last million or so years of climate change. One can only get so far averaging averages and extrapolating on that. Or if you want to get extravagant, the ptolemaic model. "Do you believe in greenhouses?" Never heard of this 'greenhouse', so claim agnostic. Same for gay marriage, but I may be converted if installed web cams in the bedroom ensure that it is all about love vice reproduction. I politely asked for an ignorant's guide to global warming and you presented the stupid's guide. That is as far as it wil go. The answer is yes, they model the last million years (for which CO2 numbers are derived from bubbles in ice) using the same models they use for projections forward and they do help us understand the dynamics of past climate change and feedback and drivers. Purdue has a good group doing this, but there are probably 100 research groups using GCMs to understand paleoclimate and test GCMs against a great number of known states and transitions. The basic principles and basis for the models is simple, and yes you can be stupid (or a 19th century physicist) and understand it. The GCMs just allow more detail and dynamics to be incorporated into the numerical models. Some things are constrained and some processes are better understood, and the relative importance of feedbacks is laid bare, but there's still a hell of a lot of uncertainty in short term projections. Mostly due to water vapor and some ocean dynamics that aren't covered very well. To tell the truth I'd say the paleo record tells us a lot more about the precise equilibrium response of earth's climate to CO2 changes. But the models are all we have for the dynamic shift. As far as believing or not, I'm not sure there is really any go to paper. There are scientific smerican type summaries, but I'd be accused of appealing to authority or something. The most convincing thing from inside the field is to look at a thousand papers looking at different aspects and to ask your own questions along the way. Eventually you develop a picture from little bits of the puzzle that make sense together.